A resort charge of 7.02USD per night will apply for all reservations. This hotel is 100pct non-smoking. Whether you*re visiting Orange County California for business or pleasure you*ll find luxurious accommodations at the Doubletree Guest Suites Anaheim Resort / Convention Center hotel located adjacent to the Anaheim Convention Center and 1 mile from Disneyland Resort and Disney*s California Adventure Park. Opened in March 2006 the premium full-service Doubletree Guest Suites hotel features Tuscan-inspired decor with contemporary flair elegantly appointed suites 7 500 square feet of event space and high tech amenities and services. Enjoy convenient access to major Southern California freeways and Orange County attractions. 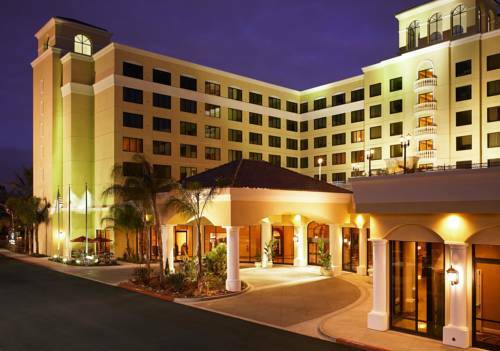 F Orange County Airport is located 12 miles from the Doubletree Guest Suites Anaheim Resort/Convention Center hotel. Walk to Disneyland Resort and the Anaheim Convention Center. Dine at the hotel*s three delicious restaurants - Agio Ristorante Grappa Lounge or Cafe Biscoti - or enjoy a night in with room service. Relax in luxurious two-room suites and beautifully appointed guestrooms each featuring Doubletree*s signature Sweet Dreams by Doubletree plush-top mattresses cozy down comforters and jumbo pillows. Lounge at the hotel*s rooftop swimming pool. Plan your Disneyland Resort vacation. Doubletree Guest Suites Anaheim Resort/Convention Center Hotel Specials - Packages Doubletree Anaheim Hotel Packages and Anaheim California Local Favorites. Things to do in Anaheim CA Anaheim California Local Attractions Anaheim Weddings/Special Occasions Anaheim Religious Retreats Anaheim Sports/Youth Tours. For savory fresh-roasted Starbucks coffee flaky breakfast pastries healthy snacks or gourmet to-go. Cafe Biscotti offers a wide range of delicious choices for breakfast lunch or dinner. Open daily at 600am. This Italian/California inspired concept incorporates the freshest ingredients and a celebration of flavors into distinctive seasonal fare. Enjoy dining in the comfort of your own suite.